From the mountainous valleys to lush-green vineyards and snow-glazed glaciers, Argentina is a country that offers adventure in extremes. A country that spans the southern tip of South America encompassing the snow-capped Andes mountains, glacial lakes, and tropical wilderness — Argentina is a nation rich in culture and exquisite in its beauty. Its diverse landscape makes it the perfect 2019 getaway. Here are 10 best places to visit in Argentina when you’re there! Known as the “Paris of South America,” Buenos Aires is glam meets grit and an intoxicating blend of European and Latin American influences. 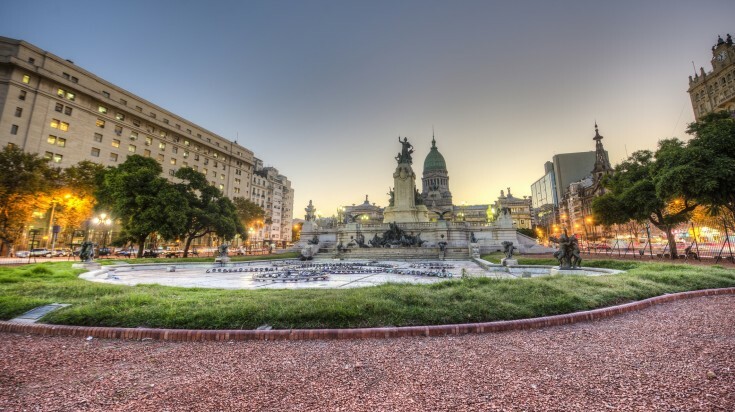 With neoclassical architecture at its helm and international influences, Buenos Aires is the heart of the complex and chaotic Latin American lifestyle. From the eclectic mix of historical architecture to the overindulgent supply of pastries and South American festive flair — it welcomes its travelers with true Latin American hospitality. Visit Argentina’s most iconic, First Lady Eva Peron, at the La Recoleta Cemetery. Watch an opera show at Teatro Colon. Spanning 2.7 kilometers wide with 275 waterfalls at its disposal, Iguazu Falls is revered as one of the world’s most riveting sights have drawn travelers from all over to witness and experience the cascades in person. Originating from the Guarani name for “big water” Iguazu Falls plays a significant part in the political and geographical structure of South America. 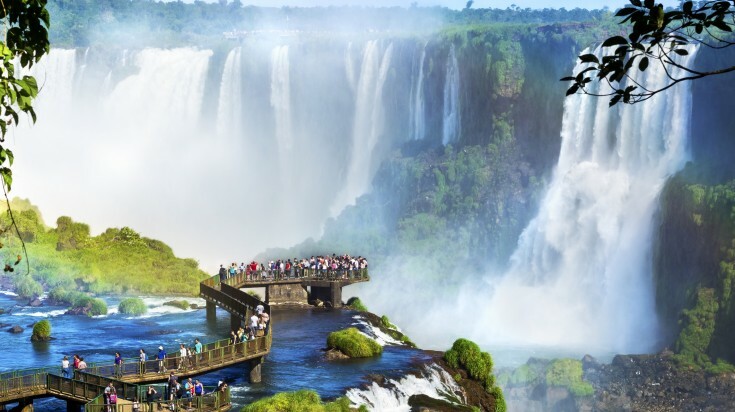 Situated on the border splitting between the Argentina province of Misiones and the Brazilian state of Parana, Iguazu Falls is surrounded by the South American rainforests and the noise of the wildlife that call the cascades home. Take a boat tour that takes you to the foot of the roaring cascades. Hike the several trails in Iguazu National Park. Part of the Patagonia region of Argentina, El Calafate hinges on the southern shore of Lago Argentino on the southwest province of Santa Cruz. Home to some of the world’s most beautiful, glacial scenery and Patagonian plains — El Calafate is a gem for those who thrive on outdoor pursuits. Its strategic location between El Chaltén and the Torres del Paine of Chile make it an irresistible place to stop and rest in the infinite scape of Argentina’s south shore. Experience and tour the Perito Moreno Glacier. Go on a kayak up the Upsala channel. Located on the Tierra del Fuego archipelago on the southernmost tip of South America, Ushuaia sits on a steep hill among the Martial Mountains and Beagle Channel. At the heart of where the Andes meet the shores of the Beagle Channel, Ushuaia is a busy port known as the “end of the world.” As the gateway to Antarctica, many Antarctica-bound vessels come to the port to stay for a while. The town has become a missionary and naval base for the navy, attracting visitors from all around for its outdoor activities and rising status as an upcoming travel gem. 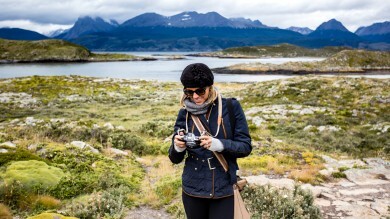 Cruise the Beagle Channel and search for the Yámana archaeological ruins. Walk with the penguins at Isla Martillo. 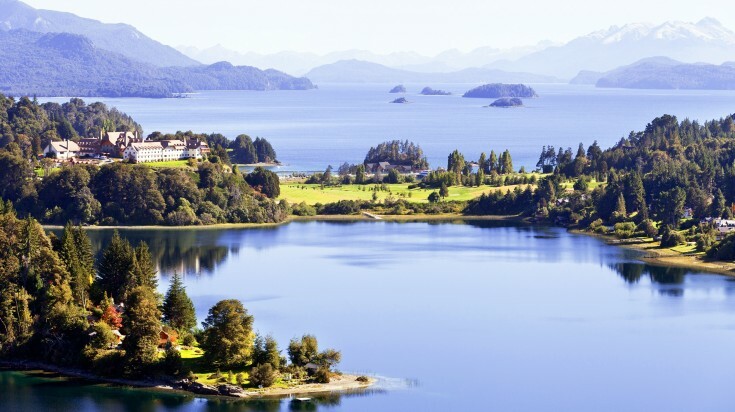 Falling on the shoreline of Lago Nahuel Huapi, a large glacial lake surrounded by the Andes Mountains, the town of Bariloche sits in Argentina’s Patagonia region. 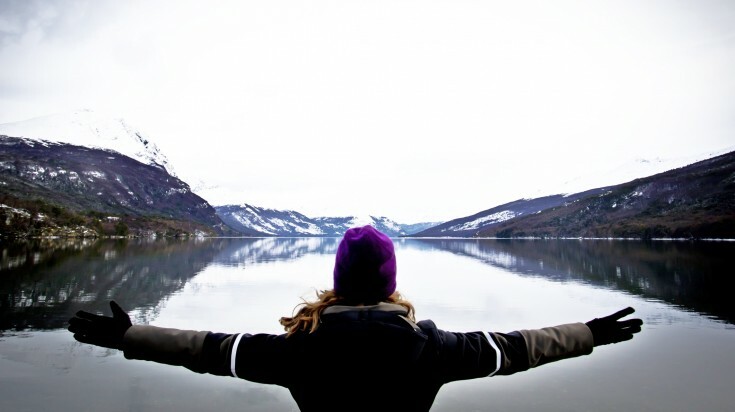 Known for its Swiss alpine-style architecture and chocolate, Bariloche is surrounded by thousand-year-old forests, crystal lakes, and snow-capped mountains. The city is known as one of the most breathtaking places in Argentina, popular both in the summer and winter season. The city exudes what it means to be Patagonian and has brought travelers from many places to seek arguably one of Argentina’s most beautiful natural spots. Take a day trip to El Bolson and eat the famous cheese and beers of the region. 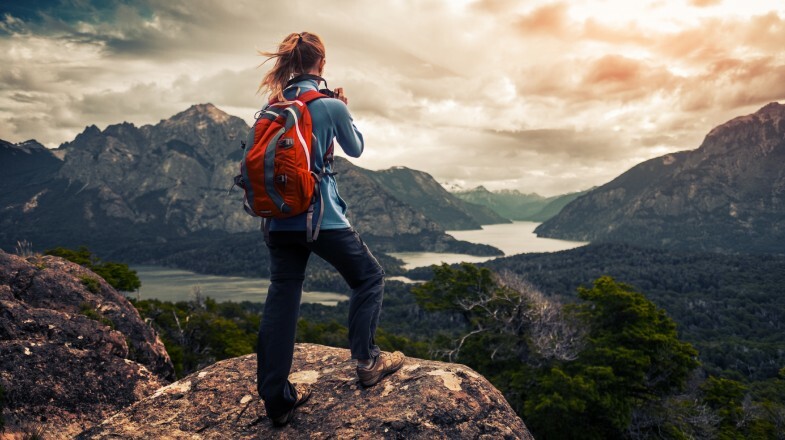 Admire Nahuel Huapi National Park and the melted glaciers at Lake Nahuel Huapi. 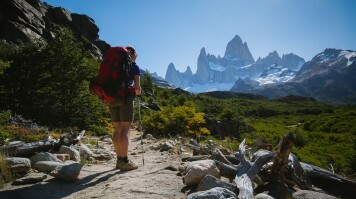 Sitting within the northern sector of the Los Glaciares National Park in Argentina’s Santa Cruz region, the colorful village of El Chaltén boasts trails and rich mountaineering heritage that have gathered climbers from around the world. 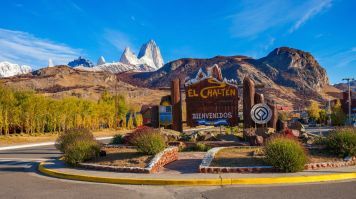 Founded in 1985, El Chaltén is a frontier town flourished in the hippie and quaint way of life. 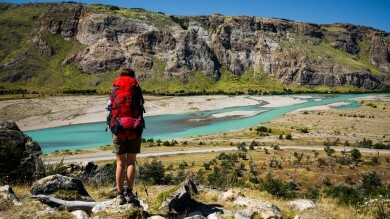 El Chaltén has increasingly become a destination for those seeking a true off-the-beaten-path experience. 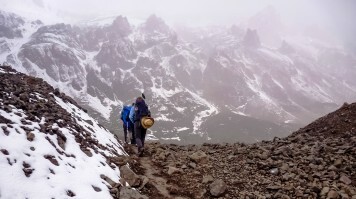 Trek out to Mount Fitz Roy and catch a glimpse of Laguna de Los Tres. 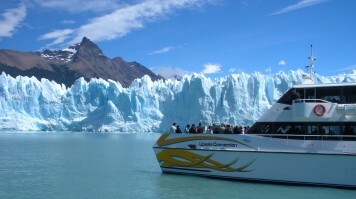 Take a glacier boat trip to Lago Viedma. 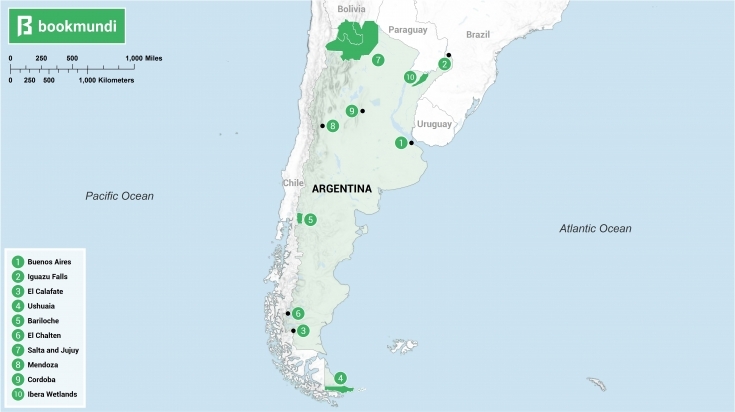 Positioned 1,500 kilometers from Buenos Aires, Salta and Jujuy are the most northwesterly provinces of Argentina. Resting intimately with Bolivia in the north and Chile to the west, Salta and Jujuy is home to the highlands and some of the greatest peaks of the Andes. The flourishing indigenous culture and rural outlook make this region a true testament of Argentina’s state before Spanish colonization. Before colonization, Argentina was filled with indigenous groups deeply rooted in Argentinean culture. If lucky, indigenous groups can still be encountered in the region today. Explore the Quebrada de las Conchas. 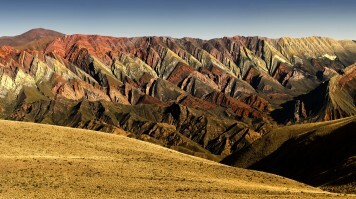 Venture out to the Hill of Seven Colors. On the western region of Argentina in the desert of Cuyo, is Mendoza, the heart of Argentina’s wine industry. 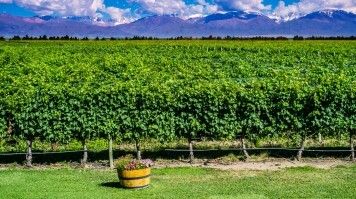 Surrounded by the highest mountainside of Aconcagua, Mendoza has an extensive artificial irrigation system that allows greenery to grow throughout the city, in particular, an overabundance of grapes for wine creation. Bustling with cosmopolitan cafes, leafy avenues, large plazas, and long stretched sidewalks, Mendoza is a lively city ready for all travelers to spend a night. Bike through the vineyards and visit the many wineries in the region. Enjoy an impressive view of Mount Aconcagua from Confluencia Base Camp. Located 700 kilometers northwest of Buenos Aires, Córdoba carries a different personality than its sister city of Buenos Aires. Set in the Las Sierras mountains of central Argentina, Córdoba is renowned for its fun-loving and welcoming character. The city is a fusion of 17th century Jesuit colonial architecture with modern art galleries and rising new design. Córdoba leads a more laid-back way of life with its rugged outskirts as the perfect draw for those with an adventurous heart. Go rock climbing at Los Gigantes. Hike the caves and find indigenous cave paintings at the Cerro Colorado Reserve. At the heart of the central northeast part of Argentina is one of the most important and largest freshwater reservoirs of South America. Ibera Wetlands spans the Argentinean region of Mesopotamia. The wetlands are surrounded by the rivers of Parana, Uruguay, and Iguazu filled with rich wildlife, natural history, gauchos, and the Atlantic rainforests. The diverse landscape and versatile agriculture serve as a refuge for various species of wildlife who have found safety within the grasslands. 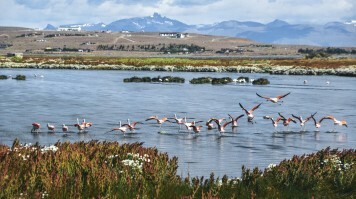 Explore the lagoons of the Ibera Wetlands and find cattle, pampa deer, fauna and other rare species that inhabit there. Horseback ride across Ibera’s swamps and wetlands. Defiantly unique, Argentina is a country of many faces. The country comes together to give travelers an experience of a lifetime — filled with city bustle, natural wonders, culture, tango and unrivaled views from some of the world’s greatest sights. Make 2019 a stamp year and discover some of the best places to visit in Argentina. 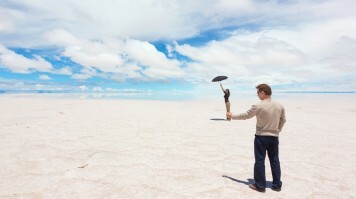 Also check out out list of best things to do in Argentina!